Summer at the studio (and this was what the studio looked like in February). Cups of tea in the sun. Crayons. Lunch out of doors. An open door. Bumblebees. A New Year begins with a blend of old and new. I decided to actually use some of the scrumptious stationery that I keep saving for a special day, a special project. Why not start the year by making 2010 special, I thought, and broke in my orange leather note and sketchbook with some sketches for fabric designs. One of my Christmas presents was a new diary from Swedish Ordning & Reda, whose range of funky, colourful stationery make your eyes smile! For daily use, I like the calligraphy pen and packs of gel ink pens from earth-friendly, minimalist and innovative Muji from Japan. The box of delightful origami paper has been salvaged from my collection of paper treasures and I'm using it for notes and to-do's. It felt like a bold step, but I wasn't prepared for just what a huge difference it makes to my days! It's a simple technique. I write down one thing to do on the back of a piece of origami paper, and when the job's done the origami paper goes on my notice board, creating a beautiful collage, and a rewarding, visual payoff. 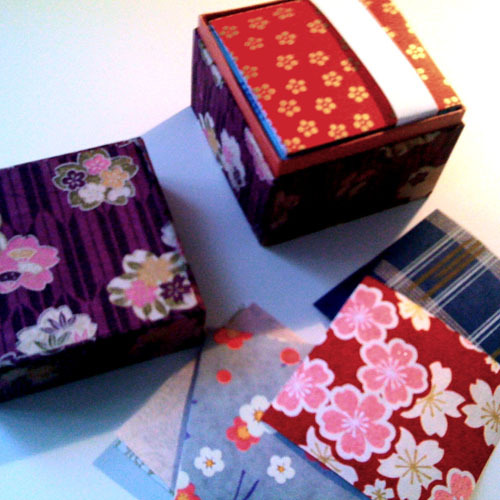 It's so inspiring and tactile to handle and use these gorgeous origami papers daily, and in a casual way. Now that my desk has a little stack of purple and orange stationery to keep me inspired and on track, I cleaned up my disastrously messy computer desktop. Then I weeded out my RSS feed, e-mail subscriptions and bookmarks to a minimum. Now I feel happy and wildly virtuous, and I think I'll put-off sorting out my e-mail and have lunch instead!